Taunton Somerset TA4-The property is located in a lovely village just 10 minutes drive from Taunton. A car owner/driver essential as there is limited public transport. A friendly and fun elderly person with reduced mobility is seeking a Sharer for their home to give them a mix of 15 hours’ help and company each week in exchange for the low-cost accommodation. This person would really benefit from some practical help around the house, shopping (or taking the person shopping) plus the reassurance of having someone living in their home. The person has a good appetite and enjoys a variety of food including roasts, soups, pies, stews etc. 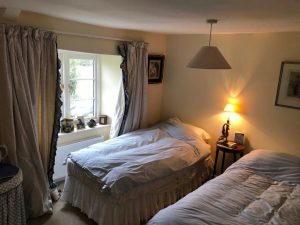 The accommodation on offeris a large furnished double bedroom with it’s own bathroom, and shared use of the home’s other facilities including kitchen and garden. The person enjoys reading the newspaper, listeing to Radio 4, watching new documentaries and thrillers, and playing Bridge and other card games. They come from a close family and have children and grandchildren who visit. They love chatting. The ideal Sharer will be a mature, friendly and reliable female, non-smoker who ideally shares some of the person’s interests. £125+ 20% VAT per month [Total £150 per month]. Plus possible contribution to Council Tax (£25 per month). NB Full-time students are exempt from Council Tax. A house-trained pet may be acceptable.